Previous urban core versus suburban and exurban analysis relied principally on municipal boundaries, and assumed the urban core to be defined by one or more central municipalities. However, such analysis classifies large suburban areas, such as most of New York City's Staten Island as urban core, while classifying large, dense, transit oriented areas adjacent to the city of New York, especially in New Jersey, and inner suburbs of Boston as suburban. Some central cities, such as Phoenix and San Jose are nearly all suburban in form. 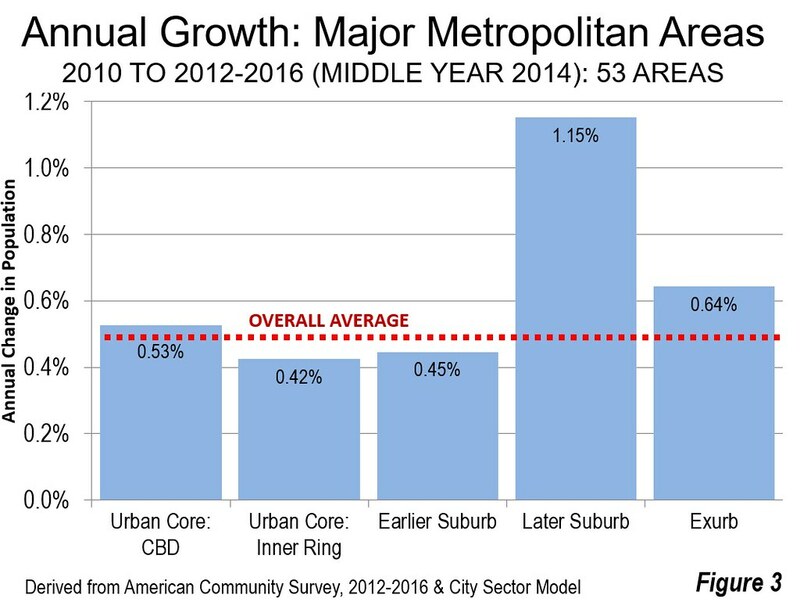 Similarly, the newer suburbs had the strongest growth rate in the middle-sized metropolitan areas, while the exurbs grew second fastest. 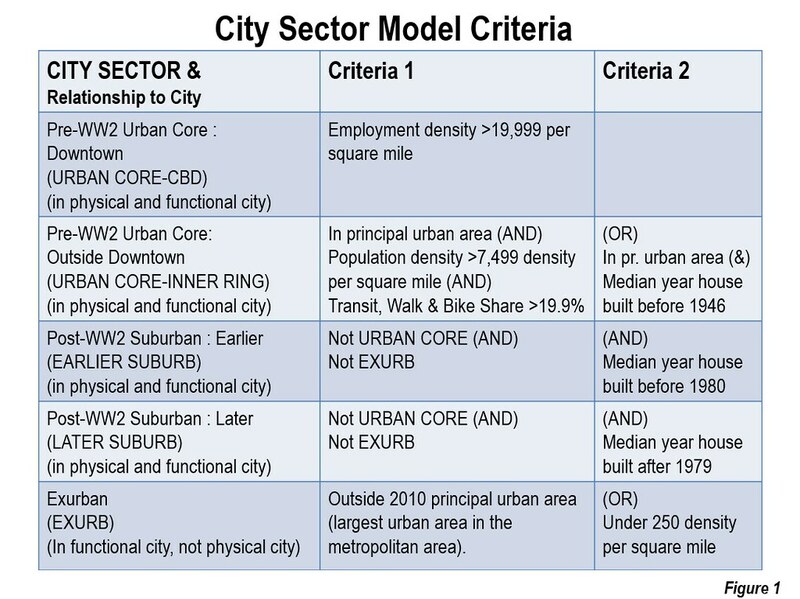 Both urban core sectors dropped in population (Figure 4). A number of major metropolitan areas have comparatively strong urban cores, led by New York, where the urban core accounts for more 53.3 percent of the population. 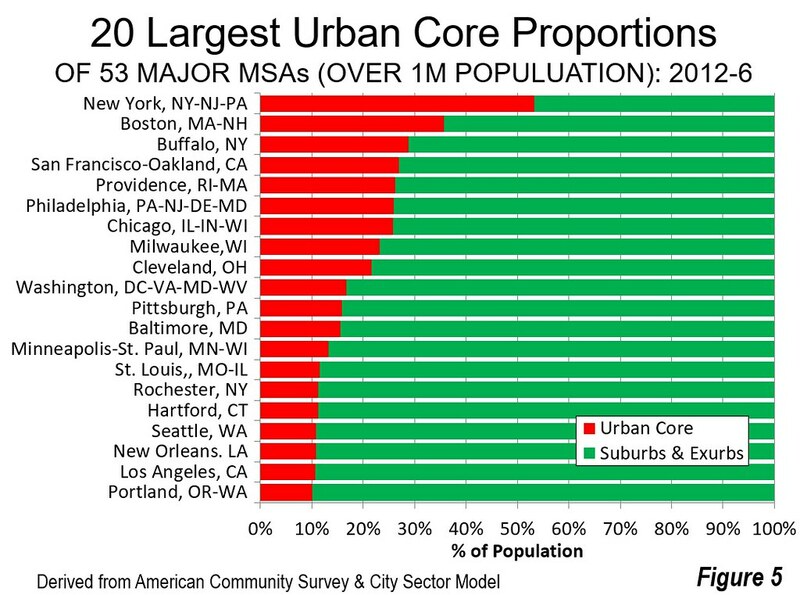 Boston’s urban core has 35.6 percent of its metropolitan area population, while Buffalo, San Francisco, Providence, Philadelphia, Chicago, Milwaukee and Cleveland have urban cores with more than 20 percent of the metropolitan population (Figure 5). However, eight major metropolitan areas ---all in the south and west --- have virtually no urban core (with pre-war urban form characteristics). 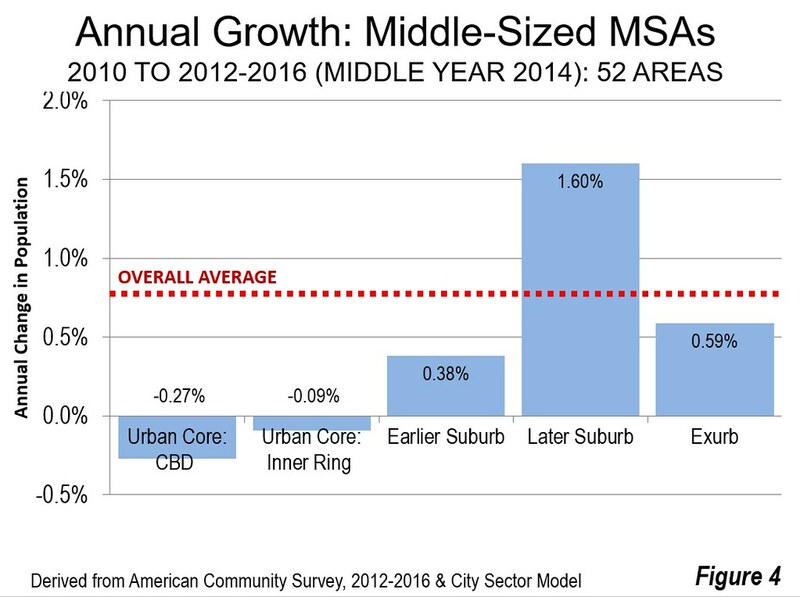 The urban cores are much smaller in the middle-sized metropolitan areas. However, the strongest urban core, in Scranton--Wilkes-Barre, Pennsylvania is second only to New York, at 36.5 percent, ahead of even Boston (Figure 6). Scranton--Wilkes-Barre is an extraordinary story, having missed out on the suburban led prosperity experienced just about everywhere else in the United States. In 1910, Scranton--Wilkes-Barre ranked 18th in population among today’s metropolitan areas (present geographical delineation); in 1930, Scranton--Wilkes-Barre led Seattle in population. Yet, since that time, Scranton--Wilkes-Barre has experienced substantial economic reverses, the victim of declining coal production in the Wyoming Valley (also called the “Anthracite Valley”). In 1930, at its peak, Scranton--Wilkes-Barre had a population of 770,000, which by 2017 had fallen to 555,000. This 28 percent population loss was far greater than that of any other of the 107 metropolitan areas with more than 500,000 population. Only one other metropolitan area lost population, Pittsburgh (2 percent). 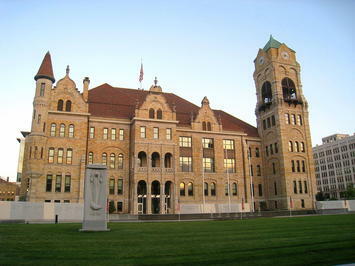 Among the other metropolitan areas, all gained population, with the slowest growth in Youngstown (18 percent). Other rust belt metropolitan areas experienced larger gains, such as Buffalo (25 percent), Akron (82 percent) and Detroit (88 percent). The average metropolitan area population increase from 1930 to 2017 was 230 percent. However, Scranton--Wilkes-Barre may be in for a revival, located just beyond the expanding commuting shed of New York. 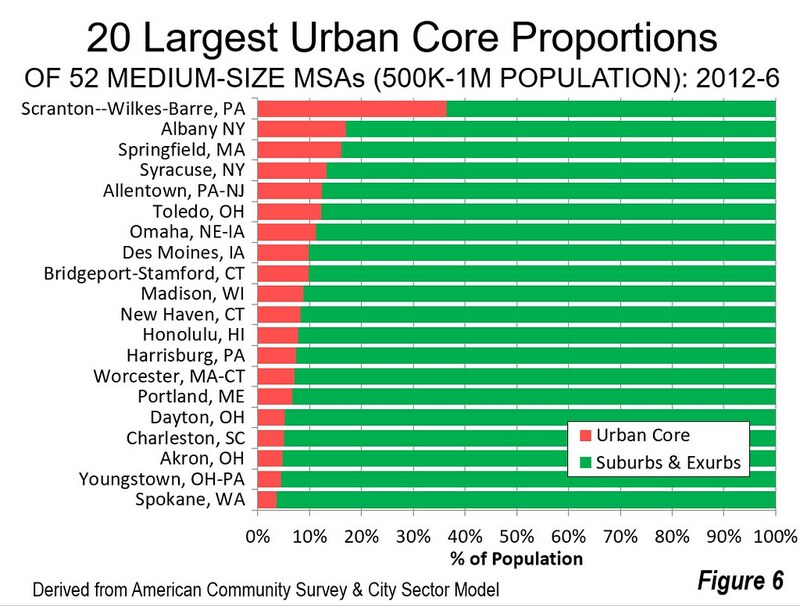 Albany and Springfield, MA have urban cores above 15 percent, while Syracuse, Allentown, Toledo, Omaha, Des Moines and Bridgeport-Stamford have urban cores with 10 percent or more of their population. Seventeen middle-sized metropolitan areas have virtually no urban core. 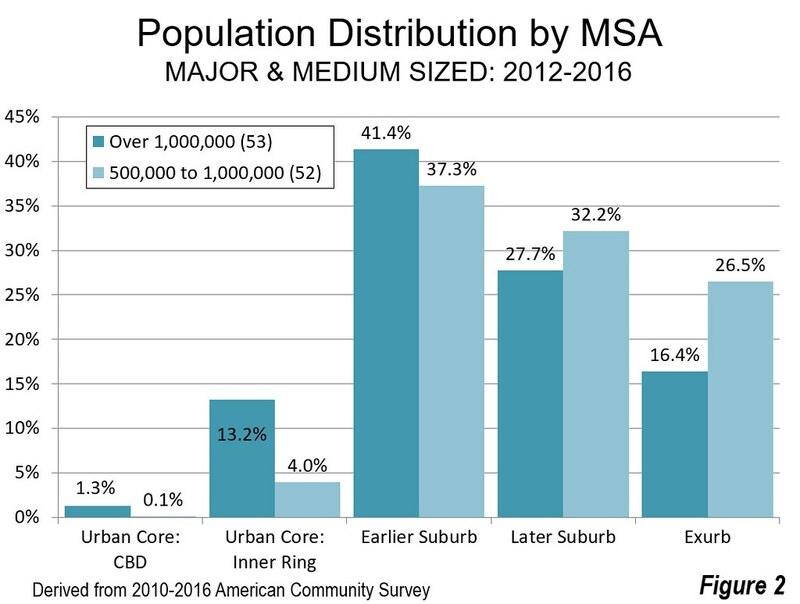 Combined, the 105 metropolitan areas with more than 500,000 population are 12.7 percent urban core and 87.3 percent suburban and exurban. Little of America is urban core, even in the major and middle-sized metropolitan areas. Despite the impression often portrayed by the New York based national media, the dense urban cores have just a small fraction of the nation’s population. This applies not just to most big cities but most in the second ranks as well. The ACS 5-year sample is collected over five years, in approximately weighted annual samples, from the first through the last year. It includes two general types of data, (1) demographic and (2) financial, which is inflation adjusted to the last year of the survey. Sometimes ACS 5-year data is characterized as relating to a specific year. This is incorrect, because the survey requires five years to complete. Its results reflect similar sized samples from each year. For example, the latest survey, 2012-2016 (used in this article) contains data from 2012, 2013, 2014, 2015 and 2016. The middle-year (in this case 2014) is probably most representative, but may be preferable to characterize the data as the range specified in the survey (2012-2016).